The T20 is a premium Rank III American medium tank with a battle rating of 5.0. It was introduced in Update 1.63 "Desert Hunters". Intended as a replacement for the M4 Sherman tank, it features a rear transmission that gives it a much lower profile than the Sherman series, as well as the 76 mm gun for additional anti-tank firepower. The T20 is a more mobile and smaller vehicle platform than the Sherman series. A vehicle with a similar play style to the T20 would be the T25, not surprising considering the T25 is an upgrade of the T20 prototype models. Though the armour is quite an improvement with 76.2 mm sloped, the vehicle's position in the battle ratings mean that there are still a number of tanks able to penetrate it straight through the front hull unless compound angling. Thus, the T20's greatest strength lays in its mobility. The forward and reverse speed are nearly the same due to the transmission, so retreating from cover after exposing itself to fire is easy and quick. The front placement of the turret also allows the T20 to expose the minimum amount of its body when it comes out to fire. The 76 mm can do sterling performances against vehicles of its caliber, so while the T20 itself is easy to take out, it can destroy the enemy the same if it can get the first penetrating shot off first. Ammo racks of the T20. Offense: The T20 in an offensive mode should be done by exploiting its mobility with the terrain. Thus, the T20 would be great in areas with lots of cover. Unless in a close-range engagement or in an emergency, it is not recommended to fire the T20's cannon while on the move just like any other tank as it affects accuracy. Thus, the T20 should move forwards, make contact with an enemy, fire if possible then move to cover if the enemy was not taken out with the first shot. The T20 should not go alone due to the vulnerability of its armour, so make sure allies are accompanied with the T20 for additional firepower and protection, most preferably a heavy tank. Defense: The T20 in a defensive mode should be played similarly like the M18 Hellcat due to its mobility and firepower. However, a benefit over the M18 is the increased armour, so more risk could be taken with exposing the tank to the enemy to get a good shot placement. Allow the enemy to run their tank into the T20's line of sight, don't try to move and expose the tank otherwise the attacking enemy tank would be aware of the T20's position and also may shoot first, disabling critical components if not destroying the T20 outright. Due to the positioning of the internal components, an enemy tank attacking the rear would actually minimize the damage to the crew compartment as the shell must pass through both the transmission and the engine. If the turret ring and crew remain untouched (unlikely, but a possibility), the player could traverse the turret to the enemy at the rear and attack it, though the attack on the engine may also create a fire, so the FPE modification is necessary for this unorthodox method. Medium tanks are not a real issue for the 76 mm unless it is the Panther, in which case the 76 mm must be aimed at the gun mantlet to do any reliable penetration from the front. 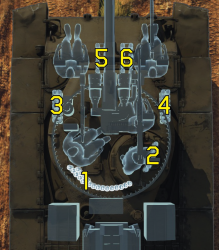 The times when any other medium tank can deflect a shot from the gun is if they compound angle their front glacis armour, so try not to waste a shot on say a T-34 that has angled its front armour 45 degrees toward the T20. It'd be a much better chance if the gun was aimed at the turret. Heavy tanks such as the Tiger I and IS-1 may be more difficult due to their thick armour and their heavy armament means a hit to the T20 is not good. Thus, it is important to catch these tanks off guard via making the heavy tanks concentrate on a different enemy while the T20 moves in for a clean shot, or catch them while reloading. Any tanks at the BR will, of course, be easy targets if the T20 catch them at their sides, which is very possible due to the greater mobility of the tank. A single hit from the 76 mm APCBC shell will devastate the interior and can lead to quick destruction or loss in combat efficiency. A lot of enemies at the battle rating can take the T20 out, even the 75 mm Shermans if they manage to hit a vulnerable point due to the APCR ammunition. It is important to avoid shots and only use the front protection as a last-hope effort, even if it is marginally better than most U.S. medium tanks at 76.2 mm thick. An important vehicle to worry about would actually be the German 88 mm Flak Half-track. It can penetrate the T20 the same with its 88 mm gun, but has a benefit of having extremely thin armour. The 88 mm would have an easy time taking out the T20 if it is an emplaced position and the T20 is out in the open. Avoid the 88 mm half-track's line of sight! 76 mm gun, reloads fast, available ammunition is good for most foes. Very mobile and fast in forward and reverse. 76.2 mm sloped front hull armour is strong against most shots, can frequently ricochet when angled. Side armour thicker than M4 Sherman (50 mm > 38 mm). Rear transmission and engine may help absorb rear shots to protect crew. RP and SL boost from premium status, great for leveling through Rank III and IV vehicles. Armour can still be easily penetrated. Small internal volume, one shot can easily knock out entire crew. Machine gun port on front is a weak point. Front ammo rack between driver & co-driver doesn't empty until no ammo is left. When the M4 Sherman went into production in October 1941, it was considered one of the best Allied tanks of the time period. However, the observers in the North African Campaign noticed a trend in German tank development. Tanks like the Panzer III were getting better frontal armour and a longer 5 cm cannon, and the same happened with the Panzer IV when it received the long 7.5 cm cannon as its main armament. These two tanks' improvements indicated that overtime, the Sherman itself may find itself on the shorter end of the stick, and thus plans for its successor started in Spring of 1942. The new tank was to have superior aspects of firepower, mobility, and armour over the M4 Sherman and German counterparts, as well as the incorporation of lessons learned from the tank fighting against German forces. The new tank was one of the more technologically advanced American tanks by attempting to meet these requirements. The layout on the tank was similar as the Sherman's, with two in the front driving compartment and three in a turret. The surface area of the tank was reduced by utilizing a box design for the hull rather than sponsons, which led to equipment being stored outside the tank rather than inside it as in the M4. The tank's size was further reduced by having the transmission design be placed in the rear of the tank by the engine rather than in the front, leading to the removal of the power shaft needed to connect the front transmission on the M4 to its engine. This arrangement led to the tank having a much smaller profile than the M4. To further improve the tank, it was decided to give the tank a high-velocity 76 mm gun. In May 1942, the first mock-up of the tank was produced, showing all its advantages over M4 Medium while keeping the same weight. Many of the observers present, including General Devers, liked the design and thus Ordnance Department continued forth with its development, designating the base vehicle as the T20. The T20 design went through many tests and variants as Ordnance try out various components and parts to see which would work best. One of the attempts was to try out different armaments as the 76 mm M1 was still new from the developmental stage, leading to the usage of guns like the 3-inch gun on the "E2" variants from the M10 and a 75 mm gun on the "E1" variants from the Sherman with an added autoloader. Transmission designs were tried as well, each with distinctive names. While the T20 designation stands for the tank with an automatic transmission, the T22 had a gear box transmission from the Sherman and the T23 had an electric drive derived from the M6 heavy tank. Of all these designs, none of the "E2" variants were produced as the 76 mm M1 proved successful, and only one "E1" was built on the T22. Another tried component was the suspension system on the T20 designs. The T20 and T22 produced in May and June 1943 respectively had an early variant of the horizontal-volute suspension system (HVSS), which would see itself on the M4 Sherman in the future (The first T23 would have the standard vertical-volute suspension system (VVSS) already used on the Sherman). Tests on the tanks progressed until Armored Force recommended the usage of a torsion bar suspension system on the tanks with wider tracks. This led to the T20E3 tank, the second pilot model for the T20, to be produced in July 1943 with said torsion bar suspension, though it would not be the only T20 series tank that would have the specific suspension. Testings with the tank in general went without much fanfare. The T20's transmission proved to be unreliable with oil leaks and overheating, but testings continued until February 1944 (T20E3 until December) when the T20 was dropped in favor of other promising designs. The T22 also encountered trouble in the transmission and engine after driving 900 miles, the continued problems also causing the T22 to be dropped in February 1944. The T22E1 design with the 75 mm auto-loading gun arrived for tests in November 1943, and though the auto-loader worked with a 20 round per minute fire rate, the insufficiency of the 75 mm gun and the questionable reliability of the auto-loader had it dropped in February 1944. Of the designs, the T23 is the one that proved promising enough for an order of 250 tanks to be placed in May 1943. The T23 tank design with the rear electric transmission was rather popular in the testing grounds. A perk of the electric transmission is that the engine's performance can be varied without being in proportion with the speed of the tank, allowing for the prolonging of the engine life. Another thing the electric transmission provide is that it could be remote-controlled (though this feature was not tested for efficiency). Ten T23 prototypes arrived at Abderdeen Proving Grounds and Fort Knox for service tests around October 1943, and while the prototypes performed well compared to the other T20 series, it was deemed unsatisfactory for combat usage for its difficult maintenance attention. Another reason they refused the tank was logistics, as accepting a totally new tank without much parts commonality with their current M4 Sherman means for the retraining of tank and maintenance crew as well as obtaining a large inventory of spare parts to keep the tank in operational order. As such, the T23 was not approved for service by Armored Forces. T23 still saw tests and in April 1943, a recommendation came in for the T23 to be used with a torsion bar suspension system, which was done and delivered in 29 August 1944 as the T23E3. After being sent to Aberdeen Proving Ground for tests and then to Fort Knox for inspection by Armored Forces, they once again refused it due to a lack in interest to the complicated electric transmission. 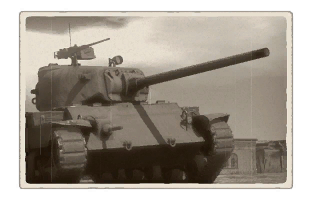 Another test attempt was on the T23E4 variant which gave the T23 tank the same HVSS as on the Sherman, however objection by the U.S. Army engineers for its excessive width and lack of attention by armoured boards once again put the T23 on hold, and kept it that way until the end of the war. With the initial rejection of the T23 by Armored Forces, it was clear that they were looking for something much more than a marginal upgrade over their existent and abundant M4 Shermans. By the time the T20 series were tested, the U.S. forces have discovered two new tanks on the battlefield, the Tiger I and the Panther. With these new benchmarks, the T20 would not be as big of an improvement over the M4 Sherman when coming up against these two specific tanks. However, not all was lost with the T20 series as Ordnance Department's tests on the tanks were incorporated into future tank designs. 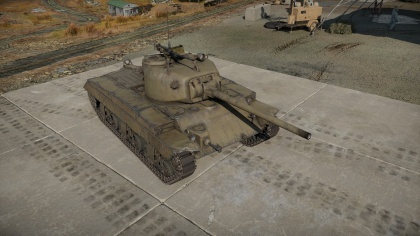 The T23's turret was first adapted onto the M4A1 Sherman to give the Sherman a 76 mm gun as the original Sherman turret with the 75 mm gun was too small for the 76 mm gun. The tested horizontal-volute suspension system on the T20s was also adapted onto the Sherman in the "E8" program, producing tanks like the M4A3E8. As these components, the T20's engineering feat carried on to help the American forces fight in Normandy and beyond. The T20 still left a basis for future designs as in the production time of the T23, the preexisting request for 250 was altered for 50 of them to be modified. 40 of them to be upgraded with a 90 mm gun and 10 more with the same gun upgrade, but with an armour upgrade as well. These programs would be called the T25 and T26; the latter eventually becoming the approved American tank M26 Pershing.